Jon:Â I think, Harold, the single thing we probably need to keep the most focus on is the tragedy of the lack of Medicaid expansions. I know youâ€™ve written about this. You know about this, but I think we cannot talk enough about the absolute tragedy thatâ€™s taken place. Really, a life-costing tragedy has taken place in America as a result of that Supreme Court decision. You know, half the states in America are denying their poorest citizens health insurance paid for by the federal government. So to my mind, Iâ€™m offended on two levels here. Iâ€™m offended because I believe we can help poor people get health insurance, but Iâ€™m almost more offended thereâ€™s a principle of political economy that basically, if youâ€™d told me, when the Supreme Court decision came down, I said, â€œItâ€™s not a big deal. What state would turn down free money from the federal government to cover their poorest citizens?â€ The fact that half the states are is such a massive rejection of any sensible model of political economy, itâ€™s sort of offensive to me as an academic. And I think itâ€™s nothing short of political malpractice that we are seeing in these states and weâ€™ve got to emphasize that. Harold:Â One of the things thatâ€™s really striking to me is thereâ€™s a politics of impunity towards poor people, particularly non-white poor people that is almost a feature rather than a bug in the internal politics in some of these states, not to cover people under Medicaid, even if itâ€™s financially very advantageous to do so. I think thereâ€™s a really important principle to defeat this politically, not just because Medicaid is important for people, but because itâ€™s such a toxic political perspective that has to be â€¦ It has to be shown that that approach to politics doesnâ€™t work because otherwise, we will really be stuck with some very unjust policies that will be pursued with complete impunity in some of these places. Jon:Â Thatâ€™s a great way to put it. There are larger principles at stake here. When these states are turning â€“ not just turning down covering the poor people â€“ but turning down the federal stimulus that would come with that. They are not just not interested in covering poor people, they are willing to sacrifice billions of dollars of injections into their economy in order to punish poor people. It really is just almost awesome in its evilness. We can’t specifically predict atrocities such as occurred in Sandy Hook. Yet the Medicaid expansion in health reform is an important step in addressing violence by mentally-ill offenders. Itâ€™s a strange thing. Newtown was an atypical crime, committed by an atypical offender, using a murder weapon that I hope will be outlawed but that remains pretty atypical for gun homicides. Even though we may not be able to stop an event like Newtown from happening again, it seems to be moving public policy more than the routine smaller scale tragedies that we could more easily prevent. Newtown has provided a genuine occasion for Americans to think seriously about gun policy, and to consider the very real challenges to our mental health system. We should make the most of this moment. Itâ€™s naive to believe that we could specifically identify someone such as Adam Lanza before he goes on a rampage, but improved policies could still prevent an unknown, maybe unknowable number of violent deaths. No one policy will dramatically reduce homicides, and the politics and administration of effective mental health policy are both daunting. But making these policies work would provide a fitting memorial to the victims of needless violence across America. While we may not be able to entirely solve the tragedies that occur at the intersection of mental illness and gun violence, surely we can do better than weâ€™re doing now. During the health reform fight, a handful of people emerged with distinctive voices, who had a huge impact. The best of them combined the policy expertise, empathy, and graceful writing to command public attention as we finally extended health insurance coverage to millions of people. Jonathan also originated and ran an influential blog called â€œThe Treatment,â€ covering the daily fight over health reform. I was a special correspondent for â€œThe Treatmentâ€ during 2009 and 2010.Â Having Jonathan as my editor there was a just a very special opportunity for me in my midlife-crisis journalism career. Jonathan and I sat down for a two-part video conversation at healthinsurance.org regarding how health reform is going, the Presidentâ€™s inaugural address, and other matters. Please check it out. Some of the video is included above. An edited Â transcript follows, below the fold, for those who prefer. Central to my book is a set of health reform policies that I claim represent the type of deal that would emerge if the two sides actually negotiated with one another. For such a deal to emerge, it would take both sides being clear about what their primary interest was in health policy. For Progressives, universal coverage has always been the holy grail and dream deferred, not just of health policy, but really of all social policy. As I noted in this debate with Jim Capretta, I don’t think Conservatives have an interest that is so clear and heartfelt as universal coverage is for Progressives, but if I had to take a stab, I would claim that it is their belief that people don’t have enough “skin in the game.” As an aside, this makes little sense to me, and when I look at empirical data on cost sharing with my more conservative friends, we see different things. In a similar way, when I say that I think the lack of a predictable, universal health insurance coverage scheme is an existential mark against our nation, they don’t get my degree of feeling. 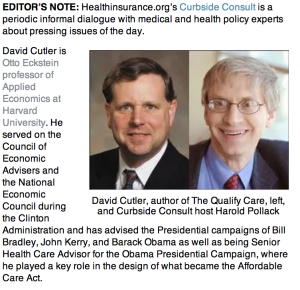 Author Don TaylorPosted on May 16, 2012 Categories Health & MedicineTags Affordable Care Act, Balancing the Budget is a Progressie Priority, Campaign 2012, Health Care, Health Reform49 Comments on What Would a Health Reform Deal Look Like? Greg Sargent noting that in spite of the Affordable Care Act not being overly popular as a whole, focus on health reform during the election could be helpful to the President. I would agree and go even a bit further, and say that avoiding health reform discussion since passage of the law has enabled Republicans to get away with only being clear about what they are against, and let them off the hook from offering a coherent alternative. The more discussion about health reform during the election the better. If Republicans move toward a plan that attempts to substantially address coverage, cost and quality, it will start to look an awful lot like what they have been against. If they don’t offer a comprehensive plan, then they will have no answer to one of the key issues facing our country. The Affordable Care Act was a good step because it was a step; we desperately need to take the next one and find some set of health reform policies that we will actually TRY. It will take both sides to do this, and an important step is to smoke Republicans out on what they are really for (if anything). This is a time where the Rove playbook–go on offense around a presumed weakness–should be co-opted by the President, both for policy and political reasons.